Uncle Boonmee Who Can Recall His Past Lives (Thai: ลุงบุญมีระลึกชาติ; rtgs: Lung Bunmi Raluek Chat) is a 2010 art drama Thai film written, produced and directed by Apichatpong Weerasethakul. The film, which explores the theme of reincarnation, won the Palme d'Or at the 2010 Cannes Film Festival, becoming the first Thai film to do so. The film centers on the last days in the life of its title character. Together with his loved ones – including the spirit of his dead wife and his lost son who has returned in a non-human form – Boonmee explores his past lives as he contemplates the reasons for his illness. Uncle Boonmee Who Can Recall His Past Lives is the final installment in a multi-platform art project called Primitive. The project deals with the Isan region in Thailand's northeast, and in particular the village of Nabua in Nakhon Phanom, near the border of Laos. Previous installments include a seven-part video installation and the two short films A Letter to Uncle Boonmee and Phantoms of Nabua, both of which premiered in 2009. The project deals with themes of memories, transformation and extinction, and touches on a violent 1965 crackdown on communist sympathisers in Nabua by the Thai army. Regarding the feature film's place within the overarching project, Apichatpong has said that it "echoes other works in the 'Primitive' installation, which is about this land in Isan with a brutal history. But I'm not making a political film - it's more like a personal diary." According to Apichatpong, the film is primarily about "objects and people that transform or hybridise". A central theme is the transformation and possible extinction of cinema itself. The film consists of six reels each shot in a different cinematic style. The styles include, by the words of the director, "old cinema with stiff acting and classical staging", "documentary style", "costume drama" and "my kind of film when you see long takes of animals and people driving". Apichatpong further explained in an interview with Bangkok Post: "When you make a film about recollection and death, you realise that cinema is also facing death. Uncle Boonmee is one of the last pictures shot on film - now everybody shoots digital. It's my own little lamentation". Apichatpong Weerasethakul says that a man named Boonmee approached Phra Sripariyattiweti, the abbot of a Buddhist temple in his home town, claiming he could clearly remember his own previous lives while meditating. The abbot was so impressed with Boonmee's ability that he published a book called A Man Who Can Recall His Past Lives in 1983. By the time Apichatpong read the book, Boonmee had died. The original idea was to adapt the book into a biographical film about Boonmee. However, that was soon abandoned to make room for a more personal film, while still using the book's structure and content as inspiration. The stories and production designs were inspired by old television shows and Thai comic books, which often used simple plots and were filled with supernatural elements. The film was an international co-production between Apichatpong's company Kick the Machine, Britain's Illuminations Films, France's Anna Sanders Films, Germany's The Match Factory and Geissendörfer Film- und Fernsehproduktion and Spain's Eddie Saeta. It received 3.5 million Baht in support from the Royal Thai Ministry of Culture. Filming took place between October 2009 and February 2010, as the weather conditions allowed, both in Bangkok and the northeast of Thailand, Isan. The movie was shot with 16 mm film instead of digital video both for budgetary reasons and to give the film a look similar to that of classic Thai cinema. "I was old enough to catch the television shows that used to be shot on 16 mm film. They were done in studio with strong, direct lighting. The lines were whispered to the actors, who mechanically repeated them. The monsters were always in the dark to hide the cheaply made costumes. Their eyes were red lights so that the audience could spot them." The film premiered in competition at the Cannes Film Festival on 21 May 2010. Theatrical distribution in Thailand was at first uncertain. "Every time I release a movie, I lose money because of the advertising and promotion, so I'm not sure if it's worth it, even though I would love to show it at home", Apichatpong said in an interview. On 25 June, however, Kick the Machine released it in a month-long run, limited to one theater in Bangkok. It passed uncut by the Thai censorship board, despite featuring scenes similar to those cut from the director's past two feature films. Distribution rights for the United States were acquired by Strand Releasing and it was released on 2 March 2011. Cartoonist Chris Ware created the poster for the U.S. release. Uncle Boonmee Who Can Recall His Past Lives has received universal acclaim from critics. On review aggregator website Rotten Tomatoes, the film currently holds an 88% approval rating based on 92 reviews, with an average rating of 7.9 out of 10, with the consensus stating: "Languorous and deeply enigmatic, Palme d'Or winner Uncle Boonmee represents an original take on the ghosts that haunt us." On Metacritic the film currently has a weighted average score of 87 out of 100 based on 21 reviews, indicating "universal acclaim". Sukhdev Sandhu of The Daily Telegraph gave the film a perfect score of five stars in an early festival review. Sandhu wrote: "It’s barely a film; more a floating world. To watch it is to feel many things – balmed, seduced, amused, mystified," and continued: "There are many elements of this film that remain elusive and secretive. But that’s a large part of its appeal: Weerasethakul, without ever trading in stock images of Oriental inscrutability, successfully conveys the subtle but important other-worldliness of this part of Thailand". In Screen International, Mark Adams called the film "a beautifully assembled affair, with certain scenes staged with painterly composure, and also increasingly moving as the subtle story develops. Plus Apichatpong Weerasethakul is not afraid of adding in moments of surreal humour – often laugh-out-loud moments for that – which helps the pacing of the film." Willis Wong of Intermedias Review acclaimed director's achievement: "'Uncle Boonmee' is a slow, meditative and often baffling journey visually gorgeous and worth taking." The film received a score of 2.4/4 at Screen International's annual Cannes Jury Grid, which polls international film critics from publications such as Sight & Sound, The Australian, Positif, L'Unita, Der Tagesspiegel among others. It was listed second on Film Comment magazine's Best Films of 2011 list. In the 2012 Sight & Sound critics' poll, 8 critics voted for it as one of their 10 greatest films ever made; this ranked it at #202 in the finished list. Five directors also voted, making the film ranked at #132 in the directors' poll. The film won the Palme d'Or at the 2010 Cannes Film Festival. It became the first Asian film to win the award since 1997. Apichatpong Weerasethakul became the first Thai director to receive the award. The film was selected as the Thai entry for the Best Foreign Language Film at the 83rd Academy Awards but it didn't make the final shortlist. The film won the award for Best Film at the 5th annual Asian Film Awards. ↑ Miller, Lisa (27 August 2010). "Remembrances of Lives Past". The New York Times. 1 2 3 4 "English press kit Lung Boonmee raluek chat" (PDF). Illuminations films. Retrieved 2010-05-20. 1 2 Kwai, Wise (20 April 2010). "The late, great Apichatpong". The Nation. Retrieved 1 May 2010. 1 2 Rithdee, Kong (2010-05-28). "Of monkey ghosts and men". Bangkok Post. Retrieved 2010-06-03. 1 2 Mayorga, Emilio (2010-01-20). "Eddie Saeta joins 'Uncle Boonmee'". Variety. Retrieved 2010-04-19. 1 2 Rithdee, Kong (2010-05-07). "Multiple avatars". Bangkok Post. Retrieved 2010-05-07. ↑ "The screenings guide" (PDF). festival-cannes.com. Cannes Film Festival. Retrieved 2010-05-20. ↑ Landreth, Jonathan (18 May 2010). "Q&A: Apichatpong Weerasethakul". The Hollywood Reporter. Retrieved 31 January 2016. ↑ Frater, Patrick (2010-06-23). "Uncle Boonmee set for uncut release". Film Business Asia. Retrieved 2010-07-06. ↑ Mitchell, Wendy (2010-07-06). "Strand strikes US deal for Uncle Boonmee with Match Factory". Screen. Retrieved 2010-07-06. 1 2 "Uncle Boonmee Who Can Recall His Past Lives (2010)". Rotten Tomatoes. ↑ "Ghost Stories". The New York Times. 2011-05-23. Retrieved 26 May 2011. ↑ "Vulture Premieres the Poster for Cannes Hit Uncle Boonmee, Designed by Chris Ware". Vulture. New York (magazine). 2011-02-08. Retrieved 26 May 2011. 1 2 "Uncle Boonmee Who Can Recall His Past Lives". Metacritic. Retrieved 2016-03-16. ↑ Sandhu, Sukhdev (2010-05-21). "Uncle Boonmee Who Can Recall His Past Lives, review". The Daily Telegraph. Retrieved 2010-05-21. ↑ Adams, Mark (2010-05-21). "Uncle Boonmee Who Can Recall His Past Lives". Screen. Retrieved 2010-05-21. ↑ Wong, Willis (2010-10-02). "Ghost Country". Intermedias Review. Retrieved 2010-10-10. ↑ "Uncle Boonmee Who Can Recall His Past Lives". BFI. 2013-11-17. Retrieved 2013-11-17. 1 2 O'Neil, Tom (23 May 2010). "Quelle surprise! 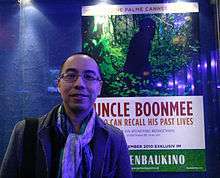 'Uncle Boonmee' nabs Palme d'Or at Cannes". Los Angeles Times. Retrieved 2010-05-23. ↑ Chang, Justin (2010-05-23). "'Uncle Boonmee' wins Palme d'Or". Variety. Retrieved 2010-05-23. ↑ "And the Hopefuls for Best Foreign Oscar Are ...". thewrap. Retrieved 2010-10-10. ↑ "9 Foreign Language Films Continue to Oscar Race". oscars.org. Retrieved 2011-01-19. ↑ Cremin, Stephen (March 21, 2011). "Boonmee claims AFA crown". Film Business Asia. Retrieved March 22, 2011.